For those of us, like me, who have spent countless hours trying to figure out the best way to get the dirt out of the grooves of our favorite “ancient” LP’s with the amazing variety of fluids, enzymes, hyper-distilled water, brushes and vacuums out there, the Audio Desk RCM has not rendered your past labors worthless. Two or three multi-step cleanings and rinsings with your Loricraft, VPI, Nitty Gritty or Keith Monks will get you pretty close. And the Audio Desk will not perform miracles…not quite. For those of us who are hopelessly addicted to those great old ’50’s and early ’60’s pressings, too many of which seem to have involved vinyl of less than stellar purity, such that even a mint copy suffers from light but quite annoying crackle or “gravel” in the background, the Audio Desk won’t make it all go away. That having been said, for this reviewer and his relationship with vinyl, there will now be a “pre-Audio Desk” and “post-Audio Desk” dividing line…much like before-and-after the dishwasher. The Audio Desk is a deceptively simple looking box with a narrow slot in the top into which you gently lower your not-so-pristine vinyl, two side-mounted controls, an ON/ OFF switch and a red START button. When you press the start button, it “beeps”. If you continue to hold down the start button it will continue to “beep” up to five times. Each beep adds another cleaning (but not another drying) cycle. Once engaged with a record in place, a reservoir fills with cleaning fluid (4.5 liters of distilled water and a 2.5 oz. bottle of surfactant plus a non-foaming bio-degradable detergent), two micro fiber-rollers on each side of the record and a rim drive engage, and for the next forty five seconds, an ultrasonic source agitates the solution causing cavitation of the record grooves while the micro fiber-rollers on each side of the record surface clean the record surfaces and also wick away the cleaning solution, where it can be filtered. Thereafter, as the record continues to rotate, the grooves are squeegeed and air-dried for another five minutes; more accurately the white wipers are only tight enough to knock down any droplets large enough/ heavy enough to drip down across the record’s label when they would otherwise reach the 12 noon position during record rotation. In operation, you insert a record, press the start button and read a book. The noise is much lower than that of the Loricraft, or the VPI for that matter, and the machine beeps when the cycle is finished, much like my clothes dryer. Occasionally, a record will need a gentle nudge to start it rotating and every so often, particularly when you switch from a 180 gram record to a thinner one, the record will have a few minute beads of water on one side or the other at the end of the spin cycle. Alright, I can hear you saying that there is no way that air drying can possibly compare to a vacuum nozzle like that of the Loricraft or Monks. In all fairness, that is what I would have said had I not tried the Audio Desk. Based on lengthy comparisons of multiple copies of the same records played on a Rockport Sirius with an Ortofon A90 cartridge, I have found the air drying process to be very effective; however, that is not to say that the cleaning fluid used will not have an impact on the final product or that it does not make sense, regardless of the machine, to do a final rinse with ultrapure water (to be addressed later in the article). In any event, air-drying does not result in the build-up of static electricity, thus records cleaned on the Audio Desk are less prone to attract dust. Best of all, I am finally making real progress clearing a backlog of records to be cleaned. In the past with the VPI or Loricraft it was unusual for me to clean more than 10 or 12 records during a single session. During my first session with the Audio Desk, I cleaned 50. Okay, so the Audio Desk is exceedingly easy to use, compared to standing over one’s vacuum RCM, holding the brush on the vinyl as it spins, then waiting for the enzymes, if any, to take effect, then brushing again, then vacuuming, etc. But at $4,000, does it offer more than that? Does it clean records better than the vacuum RCM’s that we’ve come to know and love? Short of examining freshly-cleaned records under a microscope, which I could not do in this case, we only have our ears with which to evaluate the effectiveness of LP cleaning methods, and even then, there are complications. But that’s the fun part, right? So let’s look at my first effort to see what the Audio Desk could do in the resuscitation of some old guys: late 50’s, early 60’s EMI/Columbia’s, Capitols, DG Large Tulips, Decca SXL 2000 series and — gasp! — a Decca LXT Gold/Orange label mono. We vinyl junkies may fear that record-collecting is nearly a lost art, but I have the relative good fortune of living only a half-block away from another one of us — which proves something, I’m sure. This fellow is a bit OCD about obscure old records, almost more than me, as well as the cleaning of same. So I invited him to stop by with an arm-load of the “hard ones” — records that had been through multiple cleanings with various fluids that nevertheless continue to suffer from noise issues caused by something other than scratches…in other words, mysterious crackle or “gravel” as we call it. He eagerly obliged, and shortly was at my doorstep with Giuliani’s Debussy debut, Columbia SAX 2463 (from 1963); Leinsdorf’s early Debussy and Ravel with the LA Phil, Capitol “FDS” pressing, SP 8395 (a demo copy, early 60’s vintage), Stokowski’s Debussy and Ravel from the same period with the LSO, Capitol SP 8520; and Beethoven’s Archduke Trio with the Trio di Trieste, Decca FFRR, LXT 2717, mono from the early 50’s (gold and orange label). Each record looked amazingly pristine for its age; a few light scuffs were the only possible visible sources for noise, and none were the culprit. All were infected to one degree or another with “gravel”, meaning a light but persistent noise floor that to varying degrees affected the listening experience negatively. My neighbor had engaged in heroic efforts to eliminate the “gravel” problem on these particular records with multiple cleanings using enzyme-based and detergent-based fluids applied with various brushes, followed by pure water washes, sucked up via a VPI vacuum. The efforts had yielded reasonable improvements up to a point, but by the third or fourth cleaning, a plateau had been reached, all at the cost of substantial time and effort, and all meticulously notated on the liner sleeve by my friend for each LP. We ran through the Audio Desk’s simple procedure for each record, which left us largely free to visit, ignoring the process until the buzzer went off at the end of each cleaning. We listened at his house, so as not to bias our impressions with a different system. As reported earlier, the Audio Desk cannot perform miracles. To the extent that there is noise based upon damage, or less-than-ideal vinyl, cleaning can do nothing, of course. So, what did we have after the Audio Desk cleaning? For the most part, the results were quite pleasing. While with each of the records there was still a hint of “gravel” in the road while playing; the threshold of audibility was below that of the music much of the time. And — while this is a bit hard to describe — there was a change in intensity of the noise floor, as well. It was less dense, less obnoxious…and left the music much easier to enjoy. While the obvious conclusion to this particular test was that the Audio Desk was doing something that other record cleaners didn’t do, our methodology suffered from one significant flaw common to most “testing” of record cleaning methods: How do you really know that the “test” cleaning with the new method is alone responsible for the improvement you hear? An additional cleaning by some different method may have been as effective. 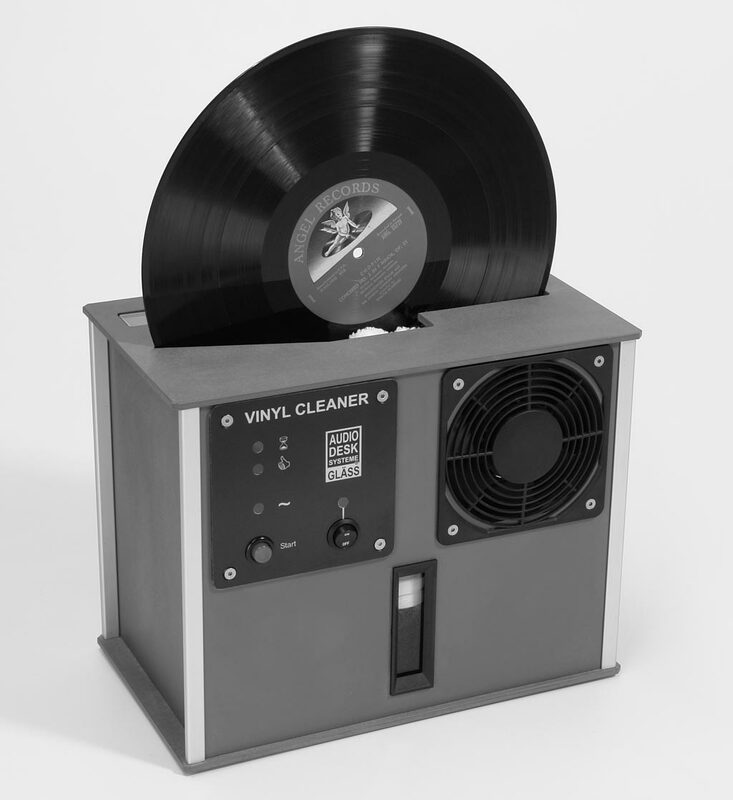 As most of us who have experimented with record cleaning methods know, subsequent cleanings, especially with different methods, fairly regularly bring about some bit of improvement…although it is also true that at some point you either come to a level of diminishing returns or simply can’t stand the hassle of yet another cleaning. So my neighbor and I decided on a different kind of test: Compare different copies of the same record cleaned different ways: one copy cleaned with the Audio Desk and one copy cleaned with either a Loricraft or a VPI with different kinds of fluids. We chose a group of old-timers again, but with one 1980’s jazz disc: Wayne Shorter’s Atlantis, Columbia FC 40055 (1985). In each case, we checked matrix numbers in the dead wax to make sure that we were comparing the same pressings, and then listened to each of them back to back. The results were somewhat mixed. Sometimes the records cleaned with the “old” technology sounded about the same as those cleaned with the Audio Desk, which in itself is a positive, in that the Audio Desk is so much easier to use, but with one in particular — the Wayne Shorter — the Audio Desk-cleaned version sounded slightly muddy in comparison to the VPI/Audio Intelligent fluid-cleaned and rinsed copy. Both my neighbor and I have become true believers in high-purity water rinses as the final step in any cleaning process. We have both tried a variety of “one-step” fluids with varying degrees of disappointment, and in each instance found that a final rinse brought about audible improvement. Yet in all the reviews we could find of the Audio Desk, and there are a number, none of the reviewers mention trying a rinse after an Audio Desk cleaning. It is perhaps worth keeping in mind that the principal “test” playback system used in our test includes the aforementioned Rockport and Ortofon combo, which is extremely effective — to the point of distraction, occasionally — at coaxing that last bit of detail out of a record, such that my finicky-ness about rinses may not be relevant to all listeners. We rinsed and vacuumed the Audio Desk-cleaned Wayne Shorter record with my Loricraft, then tried it head-to-head again with the VPI/Audio Intelligence-cleaned copy. The rinsed Audio Desk copy had a soundstage that retreated deep into the distance. The cymbal work was full and well-rounded. In contrast, the VPI-cleaned copy seemed more forward, with less information about the space around the instruments. We tried several different cuts in comparison, with the same results, generally, although sometimes the difference was fairly slight. Then we went back to a couple of the classical records that we had cleaned previously, listened, rinsed, and listened again. I came to the conclusion that, for my purposes, I rinse my Audio Desk-cleaned records on the Loricraft. I hear enough of a difference enough of the time such that it is worth it to me. Others may disagree. Should you decide to purchase an Audio Desk, I would recommend that you try a simple, quick rinse after cleaning a few times, and see what you think. As to the issue of whether one should acquire an Audio Desk, well, I certainly can understand the cost concern that some collectors might have. For me, the experience with the Audio Desk was so positive that I concluded that it was worth it to have it. The Audio Desk is the best record cleaning method I have tried. In fact, it is far superior to any other cleaning regime so long as you include a final rinse with ultra-pure water. It is also faster and far easier to use than any other method I have tried. When I listen to a record that I have cleaned with the Audio Desk, I enjoy knowing that there isn’t anything else I can do to make the record cleaner. I am also finding that I am listening to more of my LP acquisitions sooner, rather than letting them stack up in my “to be cleaned” pile. For all of these reasons, this Audio Desk unit is staying with me. And I am thrilled to have it. I would like to caution all readers who are interested in purchasing the Audio Desk. The machine has reliability issues and the manufacturer’s customer service left me wanting. I was an early adopter of the machine, after cleaning about 150 discs I drained the fluid to put in fresh one and it developed a leak. It was still under warranty do I contacted the manufacturer via email, no reply for 2 weeks. I contacted the retailer and they informed me that they are also having trouble reaching the manufacturer. One of their customers even threaten to sue them because his machine broke after a short time. We finally got a response after many weeks(a month+) to send the machines back-there were quite a few broken ones. We got them back after many months of waiting and finally they came back. I used my repaired unit to clean about 20-30 discs-at first it wouldn’t work but it was due to one of the round pads not installed properly. I stopped cleaning for about a month due to busy work schedule. When I finally had time to continue cleaning I discovered that the machine had stopped functioning. It turns on but the function would work. I wrote to the manufacturer again about this but got no response at all. It has been 3 weeks already. My unit is clearly faulty but the manufacturer is doing nothing to address it. I paid for it with my hard earned money and I find it unacceptable for the manufacturer to ignore my problem. Fred, have you tried the KLAudio machine? You say that the AudioDesk is the best of what you’ve compared it to but isn’t the KL a closer rival? KL has gotten great reviews and doesn’t seem to have the reliability issues mentioned by Chee plus is a US based company so if it does have an issue you don’t need to send it to another country. You also don’t need to give it a final rinse since there’s no solvent used. Note that I’m considering buying a cleaner and many folks have recommended the AudioDesk but I hesitate for the above reasons. Would be great to get your thoughts good and bad on it. I did contact the manufacturer of KLAudio in hopes of getting a sample for review, but they had no interest in doing so. As you comment, the KL has gotten great reviews; however, I am unwilling to recommend a product with which I have no first hand experience. My AudioDesk continues to work flawlessly. Based on the discoloration of the filter after cleaning 125 records, I am not sure that I would want to use a machine that did not have a filter. Likewise, the discoloration also suggests that rinsing makes sense if the same fluid is used repeatedly. A close friend uses a multi-step enzyme/ pure water process and then brings the “clean” records to my house and runs them through the AudioDesk followed by reagent grade water. In every instance we can hear a significant improvement, particularly with respect to dimensionality and low level detail. My advice at this point is to buy one or the other. Either should yield a significant improvement in the sound of your records over conventional machines. Have had this cleaner for 1,5 years, this is now the second time that it is on service, it has now taken 4 months and I still haven’t received it back. Don’t remember how many months it took the first time, but my patience with this company is soon gone. When the machine works, it’s great, but I don’t think this is tested enough yet, the releability and service time of a clener in this price range is far away from what it should be. If I now had to choose what cleaner I’d buy, it would surely be something else, sorry to say, but this is the fact. I have had KL audio. Mechanically and sonically remarkable. No problems. Uses only distilled water. Very pleased.